The Black and Decker steam mop comes in a wide range. Follow us as we review and compare the best Black and Decker steam cleaner range. You can use the Black and Decker for cleaning laminate floors, tiles, vinly, and many other sealed hard floors in addition to refreshing your carpets. What differentiates the Black n Decker from others is their inbuilt floor setting feature that takes guesses out of cleaning. With the floor setting feature, you can quickly turn from one-floor type to another by just pressing the floor type button for instance laminate, tiles, and more. With the Black and Decker handle command steam mop fsm1630, you can access the intuitive Autoselect Technology directly from its handle. This implies that with just a touch of a button, you can switch between mopping marble/stone, vinyl/tile and wooden/laminate floors without bending down to change the Autoselect dial. Using the floor-type guide and the pretty blue light, the unit will produce the correct amount of vapour to clean your particular kind of floor thoroughly. The Black and Decker steam burst mode makes the removal of even the most hard-to-remove stains easy. Ready for use in less than 15-seconds. Uses only steam and water to kill over 99.99% of bacteria & germs. Uses high-quality machine washable micro-fibre cleaning pads. The Fsm1630 handle command is quick & easy to use and store. 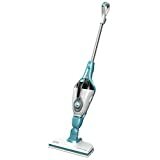 The Black and Decker FSMH1621 Steam Mop is a 2 in 1 steam mop: a floor steam cleaner and a handheld steamer. The Black and Decker FSMH1621 is white/blue in color, of 66.8 x 16.2 x 30.8 cm size, weighs 4.7kg, 1600 watts motor power and of 500ml water tank. It employs cutting edge auto select technology. It is smart enough to change the settings to suit different floor surfaces at the turn of a dial. As you can see it is easy to seamlessly transition from tiled surfaces, wooden to laminate flooring without fuss. Just prompt the handle command and the gadget will do the rest of the thinking for you. Has central digital controls that can be managed in the palm of your hand. You don’t have to fiddle with steam trigger nozzles to adjust the level of steam. Uses integrated water filter that purifies the tap water to reduce clogging. It has steer and swivel 180 degree turn capability that improves manoeuvrability. It has a steam burst feature that produces 50% more steam on demand than other comparable cleaners in the market. Quick heat up time (15 seconds) to give you 20 minutes steaming time. Easy storage; it has a wall mounting facility and a tangle free self standing auto shut capability. Has a carpet glider that freshens upholster, carpets and rugs. Dries quickly to give streak free finish. With the 7 in 1 you also get a removable handheld cleaner to out muscle grime and grease from your worktops and appliances like oven, kitchen cooker hood, window, bathroom and practically any part of the house. The Black & Decker fsmh1621 detachable steamer is a bit heavy and needs 2 hands to operate it. The cable length is slightly shorter (5m) than other comparable steam mops (7-8m). 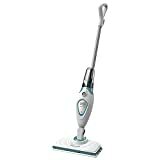 The Black & Decker fsmh1621-gb auto select 7 in 1 steam mop is a reliable and robust gadget from a trusted brand that excels at what it does. It honestly does what is says on the tin. The auto select feature was a winner for most customers. The fact that you can control the floor setting dial for different floors from the palm of your hand without the need to keep bending down to reach the dial is quite appealing. The intelligent 180 degree steer and swivel functionality brings fun back into cleaning. 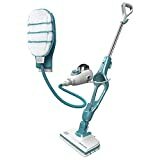 This Black and Decker FSMH1621 a must have best steam cleaner. If you are like me, you probably have one brand that you trust and will readily buy their products. Black and Decker is one of those brands that have over the years delivered quality and build trust among many people. 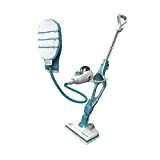 The Black and Decker Steam Mop FSM1610-GB Autoselect is one of the best floor steam cleaners uk . It does not however include a detachable handheld cleaner. The Black and Decker FSM1610-GB Autoselect is powered by a 1600 watt motor that heats the 450 ml tank in 15 quick seconds to give you up between 13-19 minutes of continuous cleaning time. Has an in-built water filter to protect your gadget from accumulating lime-scale. It features an illuminated water tank. The water tank illumination changes from red to blue when the machine is on. This helps you easily monitor the water level in case you might need to refill the tank. It also has an auto-stand feature: This means that when it is placed upright it is self-standing which also makes it to auto-shut to avoid damaging your floors. This is quite convenient if you have to stop midway cleaning to attend to something. It features an innovative 180 degrees swivel head design. This feature gives you the ability to turn the handle and the head of the steam mop will rotate to the perfect angle, allowing you an effortless cleaning in any position even under very low surfaces. It has a 5 meter power cord which is decent enough length to cover a standard room. The best part of this Black and Decker Steam Cleaner is that its tank is removable. The only down side is that this gadget does not have a carpet glider or a detachable handheld cleaner. However if you need one with a handheld, try the Black and Decker fsmh1621. There is a lot riding on the Black and Decker FSM1610-GB Autoselect. It has very tantalizing features like the swivel steering, the auto-select, the auto-stand and auto-shut that makes cleaning fun again. It cleans a treat. It can clean several floor types including stone, marble, ceramic tile, hardwood, laminate or even vinyl. The 180 degree pivoting mop head and the auto-stand also makes it easy to store. The Black & Decker fsm1610 has two pivots on the floor head and the handle. This allows you to move the handle in whichever direction you want. It also makes it easy to glide around hefty furniture or in tight spaces like under the sofa, tables and chair. The steam mop can be quickly and easily stored. Its design makes it compact when not in use. The mop is easy to assemble and the parts just click to each other. Its swivelling head makes it an easy cleaner to navigate around objects. Its detachable water reservoir is very easy for refilling. Its Self-standing convenience with the auto shut off feature while locked in the upright position makes it a convenient mop. The mop uses no chemicals, just pure water and heats up in just 15 seconds. Refilling the mop is easy and quick. The tank can also be removed and refilled with water. More so, it has received an average customer star rating of 4.2 out of the possible 5 star rating. This implies that 84% of people who bought this gadget are quite happy with their purchase. This steam mop has further featured among the top 100 best steam mops in the Amazon best-seller ranks. The Black & Decker steam mop fsm1610 will definitely give you value for money. This gadget takes guess work out of the equation of hot vapour cleaning. There is no risk of damaging your expensive laminate or vinyl flooring. It has a valuable an auto-select feature that will allow you to choose the correct amount steam released depending on the type of floor you are cleaning. The temperatures are predetermined by factory setting to ensure that you clean at the temperature most compatible with your floor. With this variable control feature, you can clean any type of sealed floor. You get a mop, cleaning pads and user manual. It comes with a machine washable patented easy glide microfiber pad that has ultimate pick up quality and lasts for at-least 100 washes. The high-quality cleaning pads are made of microfiber and use the easy-glide technology that makes them attached securely to the base of the machine when in use. The pads can be easily removed from this Autoselect Steam Mop by detaching them. As it’s the case with the other steam cleaners with the Autoselect Technology, the Black and Decker Steam Mop Deluxe can also be used on all types of sealed floors. After selecting the type of your floor, the deluxe will release the right volume of steam to the floor such that it dries fast. This steam cleaner is currently unavailable on Amazon. When the 1620 is ready for use, its tank illumination changes its colour from red to blue; and when it is locked in an upright position, it automatically turns off the flow of the steam. The Easy Glide Micro Fibre pad, which lasts for more than 100-wash cycles, ensures that the unit performs exceptionally great. Other features include: water level indication mark, resting mat, carpet glider as well as a wall attachment hole. Eliminates (or kills) 99.9% of germs and bacteria without using any chemicals. Saves time by taking only 15 seconds to heat up. Has an improved steam emission system. The Deluxe can eliminate (or kill) over 99.9% of bacteria and germs. It has also got an in-built water filtering system which ensures that the B/DFSM1620 is protected from lime scale for a long life. Since it is also equipped with Autoselect Technology, you can use it safely on all kinds of sealed floors. Just choose the type of floor, and the unit will apply the right amount of vapour to the surface, leaving it (the surface) to dry in just seconds. The swivel steering with a 180-degrees pivoting-head can manoeuvre around furniture as well as in the tight spaces. Its easy-glide microfiber pads last for more than 100-wash cycles and offer ultimate pick-up performance. 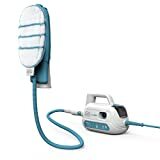 The Black and Decker steam mop deluxe (currently unavailable on Amazon) is wall mountable and it is also supplied with a cord wrap so that it is stored tidily and conveniently.